It doesn’t look like much in the chair, but that’s a lot of cutting right there. When I’ve had free moments this week, I’ve been drafting and redrafting a few of the pieces for the Simplicity 6976 pattern to make it better resemble a Burberry trench coat. I wanted to add storm flaps to both sides and a collar with a stand. Those were pretty straight forward – the first was simply based off of the front pieces of the coat, and the second was based off of Sherry’s tutorial. 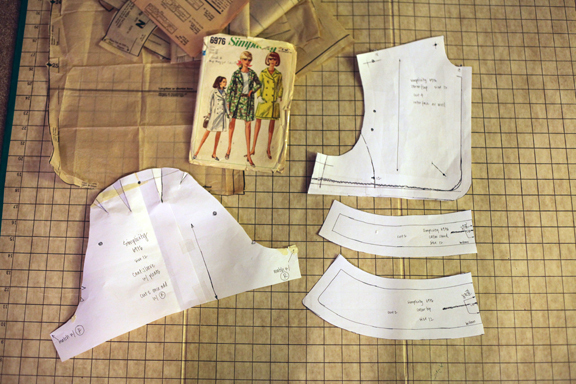 The new pattern pieces for the trench coat. More difficult were the pleats in the shoulder, as Kimbersew on Flickr predicted. I lost a day playing with paper to no avail. I should have given up since we all know how much luck I have with sleeves. (No? See here and here.) Then, I had the idea to work in miniature and make the piece three-dimensional until I got the hang of where the extra fabric was supposed to go. Finally, everything came together. I’ve outlined the basic steps for my sleeve experiment in the photo below. My experiment in adding pleats to a sleeve. 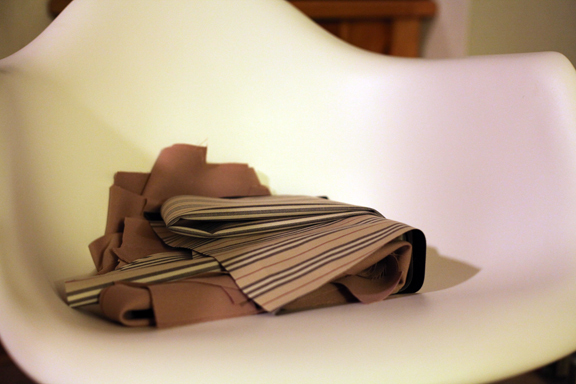 If it doesn’t work out, I can always trim the fabric back to the original sleeve shape. 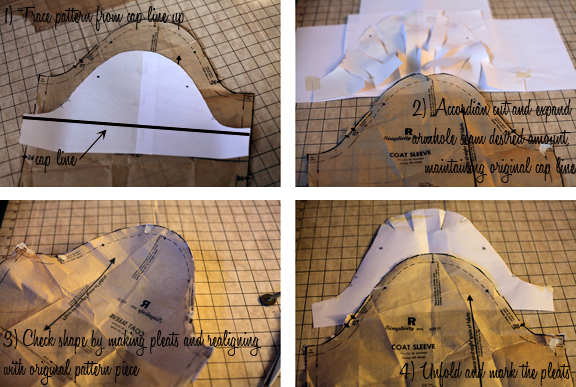 With all this drafting to make my coat look more like a ready-to-wear coat already out there, I’m reminded of a post a few months back on Gertie’s New Blog for Better Sewing about the ethics behind knocking off someone else’s design. I feel okay about putting in all this effort since I’m truly using Burberry fabric, so the company did get some of my money in the making of this coat. Plus, if I do my job right and make a beautiful coat, I’ll essentially be a walking advertisement for Burberry. With the pattern alterations done, I moved on to cutting the fashion fabric. I cut, and I cut, and I cut. I still have to apply the interfacing, but other than that, I’m keeping pace with Sherry. Hurrah!